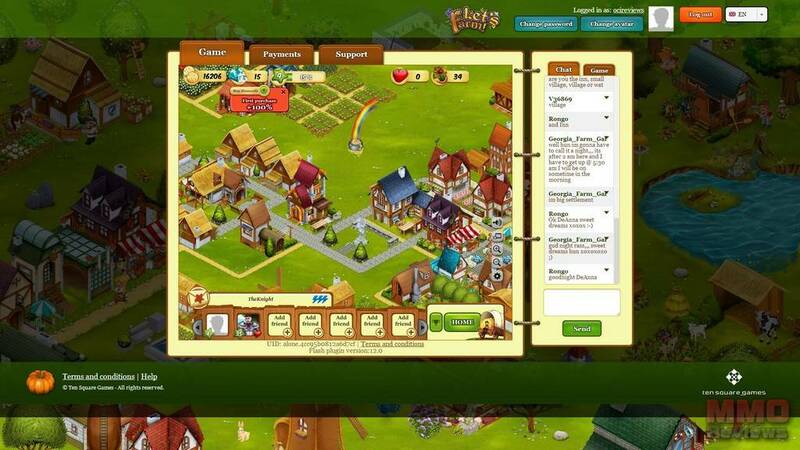 In Let's Farm players are able to construct and manage their own farm in this browser-based free to play MMO where they must build up the best farm possible, create produce to sell at market or improve their farm. The game is available in multiple region languages, is completely compatible with Facebook and also allows players to unlock new features as they continue to level up in the game. Players start out life with a relatively small undeveloped farm with just a handful of buildings to start them off and from here construct other buildings as well as enhancing their land with structures such as crop fields that allow them to grow various fruits, vegetables and crops. The different buildings generally allow the player to create a new type of produce, which can be used to improve the farm or to trade and sell. With fields players can create multiple types of produce depending on what seeds they use for planting. Constructing a building and creating produce takes time to, from minutes to hours as determined by the item and how rare/higher level it is, the higher the item the longer it will take to produce it. To speed up construction of buildings or harvesting of produce players can spend premium currency diamonds which will instantly complete production or construction without having to wait. Players will unlock new items as they level up as well as gaining access to new areas of the farm, expanding their buildable territory and giving them more room to create a much bigger and impressive farm. Buildings can be reconstructed anywhere on players owned land and they are fully responsible for the layout of the farm, even with buildings that have already been placed the player can still move them oral take them without having to rebuild from scratch. With the various produce that players can create, from vegetables, fruits, crops, to lumber and more, they are able to use these items on their farm or alternatively take them to the market to sell them and earn coins or even trade them with other players. Players will continuously be given tasks and quests to complete, though these are completely optional but will earn the player more XP and coins to spend on their farm and so are well worth taking the time to do. Many of the objectives will get players to construct a specific building, gain access to a new resource or produce a certain type of crop. There are also daily rewards that can be earned and challenges to compete against other players. Players will gain XP over time and with this they will level up, which gives access to new items, seeds, buildings, features as well as unlocking extra land for the player to build up. Players also gain a small amount of diamonds that can be used to purchase unique items or speed up production. Players are able to take their produce to market to sell it and earned coins, with hundreds of different items available to choose from players can purchase all manner of buildings, seeds and livestock to make the type of file they want to, including decorative items to make the farm look nicer. Players are able to buy fertiliser using diamonds which will help boost the speed of your crop produce. In the game players will earn gold coins as they play, from completing tasks to selling items on the market this is the main form of currency for buying and selling. Players will also be able to gain access to diamonds, which are premium currency items that are available for purchase using real-world currency and used in game to buy unique items and other boosters that will improve your farm. Looking for more Free MMO Browser-based games,Free MMO management games,Free MMOs,Free social MMO games games?